Spectacular scenery on the Karakorum Highway (KKH) during our drive from Kashgar to Tashkurgan, the very last town before the border between China and Pakistan. 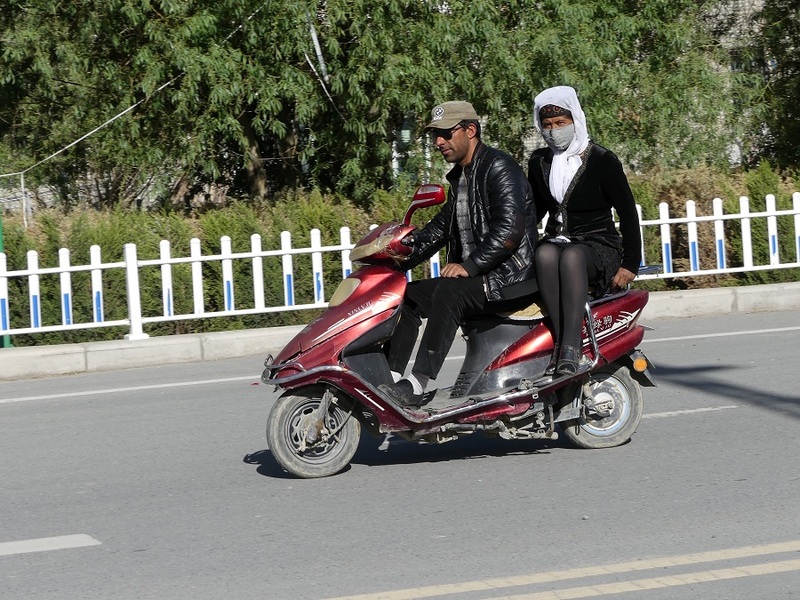 KKH runs approximately 1,300 km (810 miles) from Kashgar, China, to Abbottabad, Pakistan. Photo: Ali Karim. Copyright. 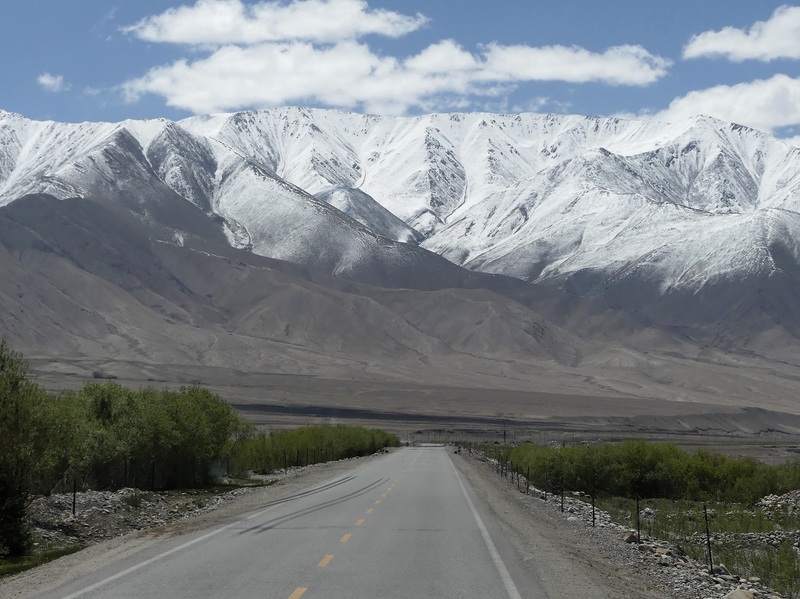 In my 3rd Silk Road installment, More Kashgar and Spectacular Drive to Tashkurgan, readers learnt about the historic city of Kashgar, and saw some stunning photos of snow-capped mountains on the Karakorum Highway (KKH), such as the one shown above, that were taken as Dilshad and I were driven to Tashkurgan. 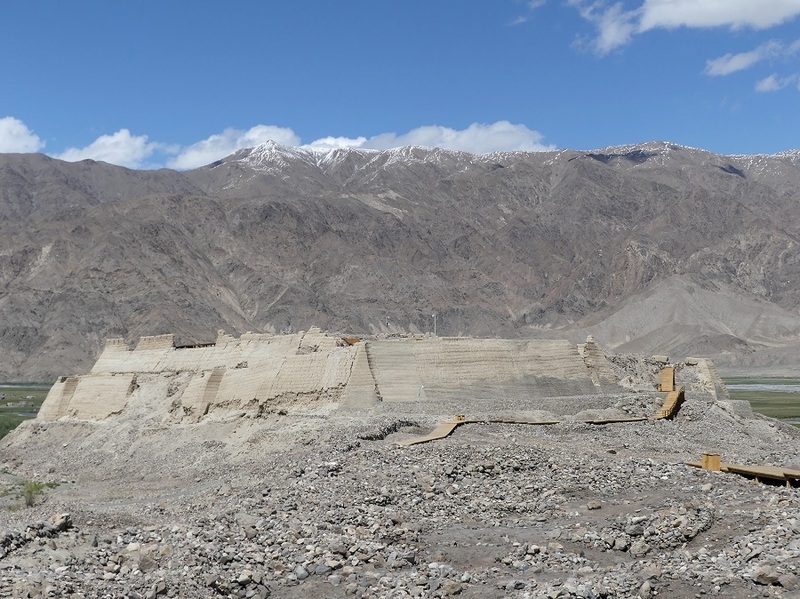 In this 4th installment, which concludes the China phase of our memorable Silk Road journey, I cover our two day stay in Tashkurgan and the bus journey to Khunjerab Pass, the world’s highest paved border crossing at almost 16,000 ft! 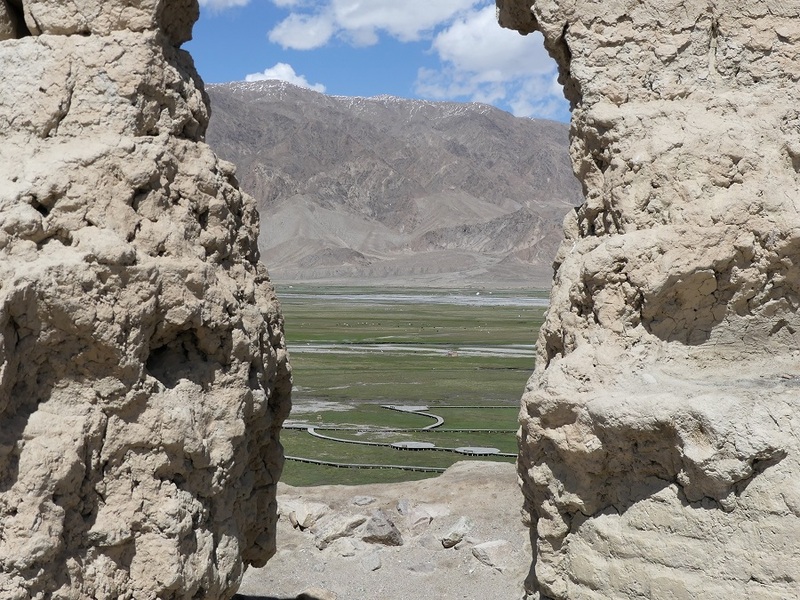 In the previous post, Ali Karim completed his coverage of historic Kashgar and the 292 km drive from Kashgar to Tashkurgan along some of the most majestic mountain settings in the world. In this 4th installment in the Silk Road Series, Ali describes his and his wife Dilshad’s 2 day stay in Tashkurgan, and their bus ride to Khunjerab Pass on the China-Pakistan border (see blue line on map). Image credit: Wikipedia. We had left Kashgar early on a Wednesday morning, and when we arrived in Tashkurgan several hours later, it was still afternoon. We therefore decided to visit the Stone Fortress, which is what Tashkurgan means in Tajik, as well as wander around the town. The historical fort was used by the local kings to collect taxes from Silk Road traders, in return for providing protection and marketplace for trading, as well as caravanserais (roadside inns) alongside ancient caravan routes. The ruins of the Stone Fort in Tashkurgan. Photo: Ali Karim. Copyright. An amazing view of the Golden Grasslands and mountains from the Stone Fort. Local farmers raise and graze their cattle, yaks, sheep, and goats in the grasslands. Photo: Ali Karim. Copyright. The grasslands down below the Stone Fort. 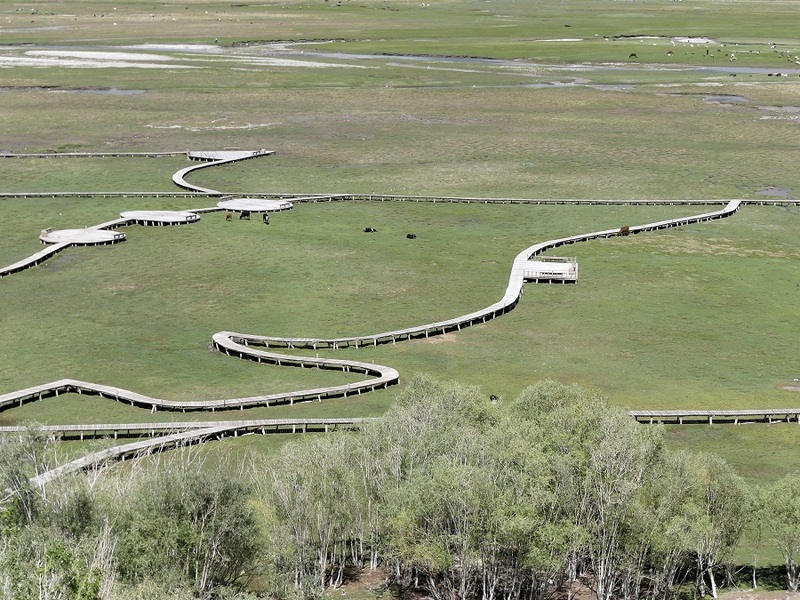 Note the new wooden pathways that have been constructed to allow people walk these beautiful grasslands. Photo: Ali Karim. Copyright. 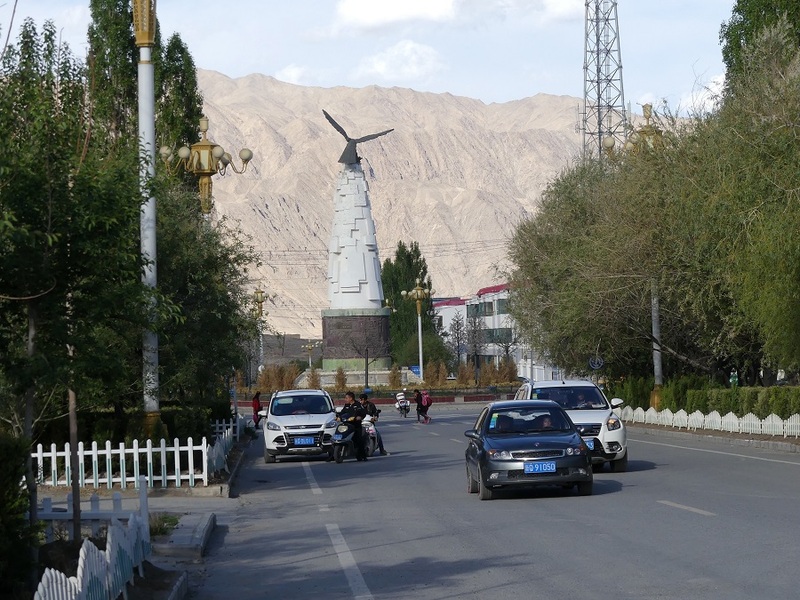 The town of Tashkurgan is modern and well built, with good infrastructure thanks to China. We walked around the town after checking into our hotel and took several pictures of the local scene. A scene from Tashkurgan. The town is situated at an altitude of approximately 3,100 metres (10, 200 feet) Photo: Ali Karim. Copyright. 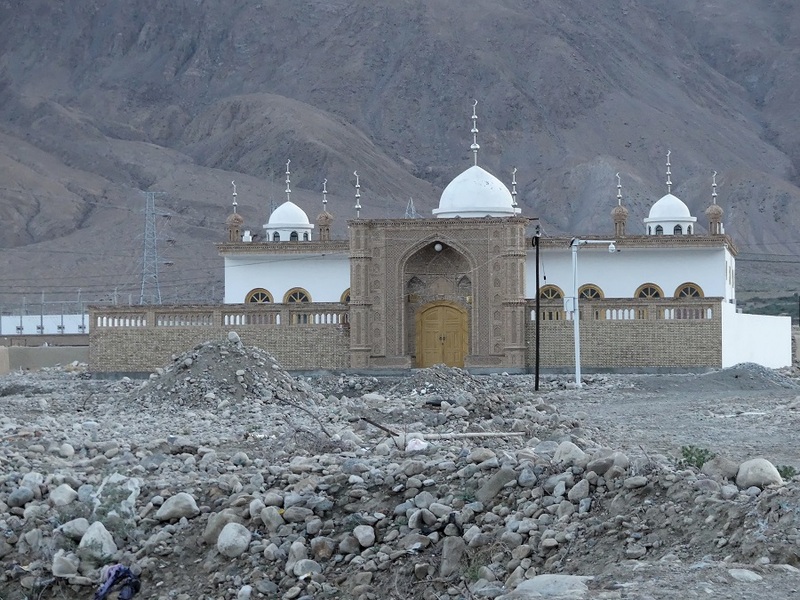 A close-up photo of a newly constructed mosque in Tashkurgan. Photo: Ali Karim. Copyright. A scene from Tashkurgan. Photo: Ali Karim. Copyright. Smiles all-around, a happy scene from Tashkurgan. Photo: Ali Karim. Copyright. A common mode of transportation in Tashkurgan. Photo: Ali Karim. Copyright. Tradition and modernity in Tashkurgan. Photo: Ali Karim. Copyright. 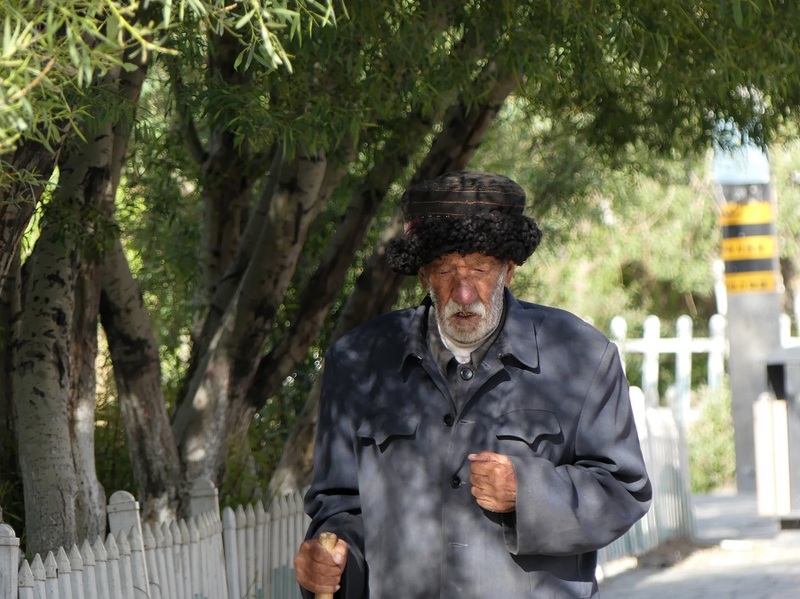 An old man in Tashkurgan. Photo: Ali Karim. Copyright. Fashionable ladies in Tashkurgan. Photo: Ali Karim. Copyright. As we searched our way to the restaurant that had been recommended, we came across a small grocery shop selling fresh vegetables, meat, and local yak milk and yogurt. One young man with very limited English translated for us with an App that they were Ismailis, and were of Tajik ethnicity. We were very happy! The Ismaili lady owner served us a delicious yak milk yogurt. She declined to take any money from us. It was too bad that we could not communicate with each other because of language barriers! 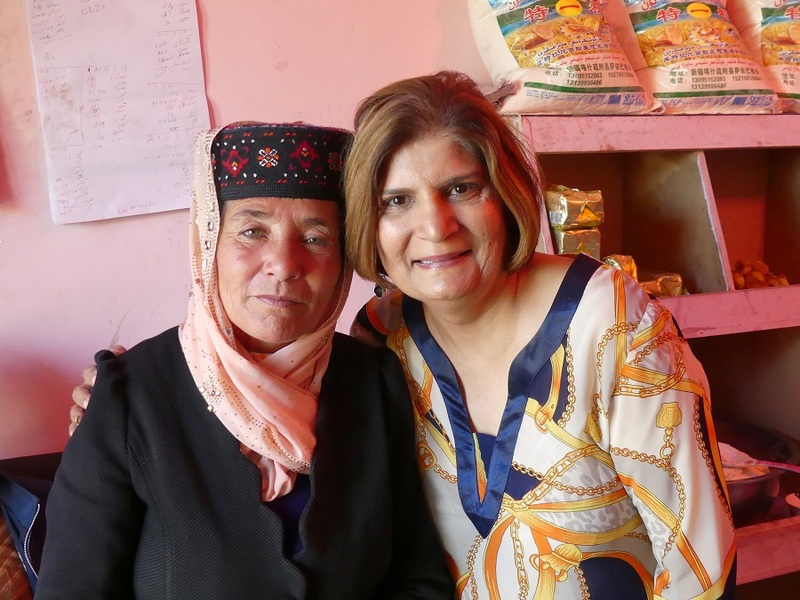 Dilshad with local Ismaili owner of grocery shop, who treated the visitor to delicious yak milk yogurt. Photo: Ali Karim. Copyright. When we next arrived at the site of the recommended Pakistani restaurant, we saw that it was being converted into a handicraft shop, whose owner turned out to be a Pakistani Ismaili! He took us across the road to another Pakistani restaurant called Wakhan Fast Food run by another Ismaili, Rehman Alikhan. We had our fill of much needed spicy food to reboot our taste buds. Apparently, a lot of the local traders in Tashkurgan are from Gilgit and Hunza in Pakistan who come to Tashkurgan and Kashgar to trade in gemstones, handicrafts and other goods, and take back with them Chinese made electronics, including mobiles, to sell in Pakistan. The Tashkurgan region borders with the Wakhan Corridor in Afghanistan, the autonomous Gorno-Badakhshan in Tajikistan and Gilgit-Baltistan in Pakistan. Similar mountain towns and communities are found along the common borders. 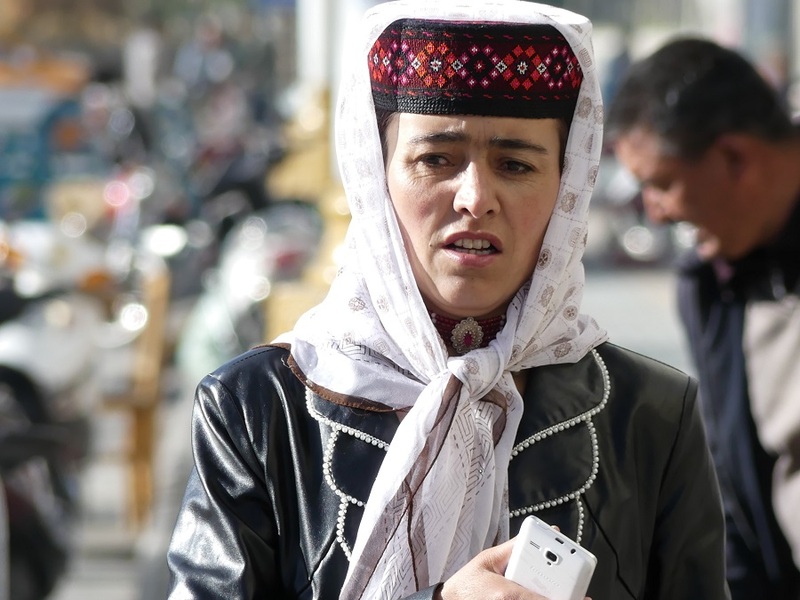 The Tajiki population in the Tashkurgan region is around 35,000 – 50,000. 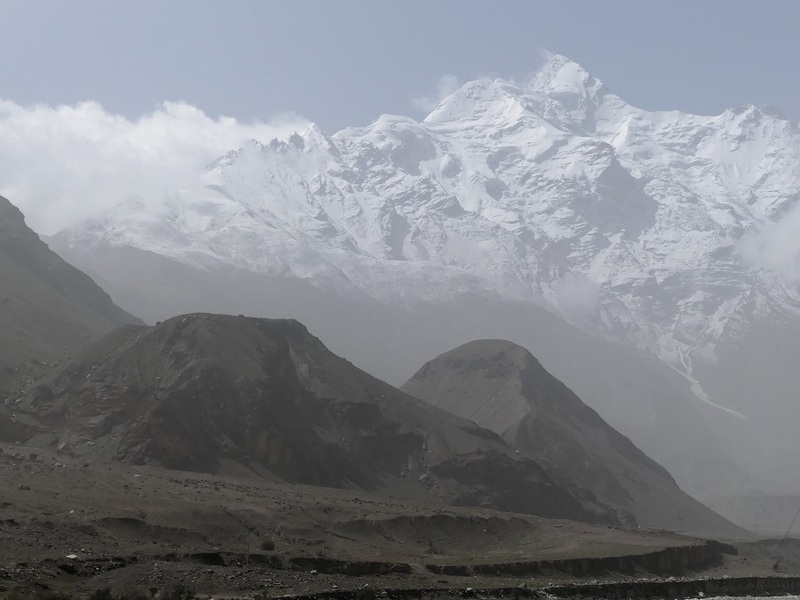 One of the languages spoken in Tashkurgan is Wakhi, which is also spoken by the people of upper Hunza valley, Gorno-Badakhshan and the Wakhan Corridor. We were anxious to visit the Tashkurgan jamatkhana, but we learnt from a Pakistani Ismaili that the jamatkhana has been closed for around 2 years. We ventured to the jamatkhana site and took photos of the building from outside. This was a touching moment for us. The Ismaili jamatkhana in Tashkurgan. The jamatkhana has been closed for the last 2 years. Photo: Ali Karim. Copyright. 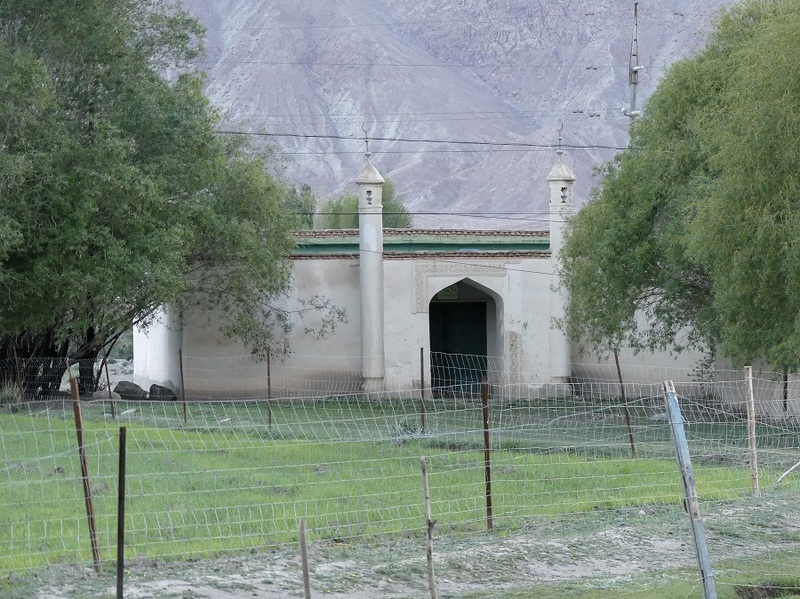 A number of Western travellers to Tashkurgan have mentioned in their blogs about a blue cabinet inside the jamatkhana that contains a photo of Mawlana Hazar Imam, His Highness the Aga Khan. One such photo of the open blue cabinet is shown below. It was produced on this blog’s sister website, Simerg, several years ago. An Ismaili elder radiantly shows a picture of Mawlana Hazar Imam, His Highness the Aga Khan. The photo was never displayed openly in conformity with Government rules, but was housed in a locked (blue) wall cabinet. The jamatkhana has remained closed for the past 2 years according to information given to Ali Karim, the author of this piece. Photo: Nuram. Copyright. 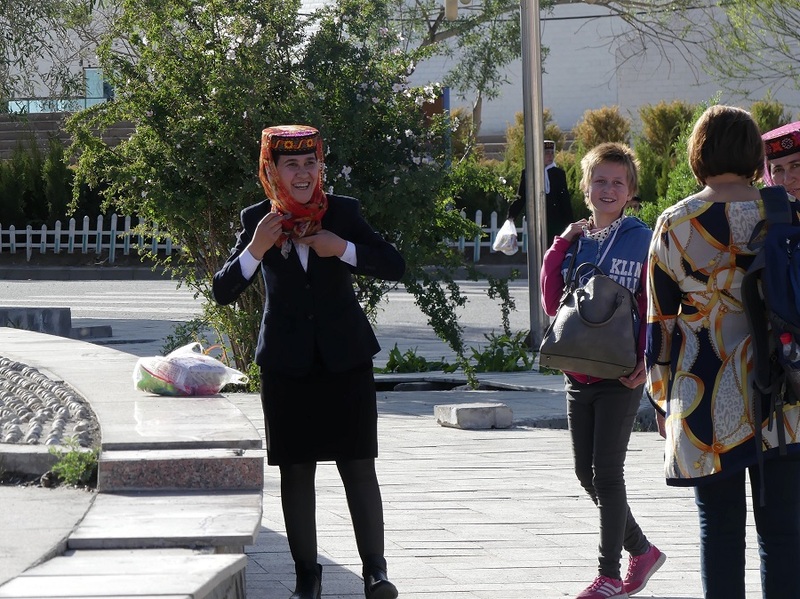 We wanted to spend more time in Tashkurgan to meet and get to know more local members of the Ismaili jamat, but we were not able to. We found out at the last minute on Thursday, a day after our arrival, that the border crossing to Northern Hunza was closed during the weekend. So we had to reduce our stay in Tashkurgan to be able to make it to the border on Friday, while it was still open. Early morning sunrise time, Tashkurgan. Photo: Ali Karim. Copyright. We woke up early Friday morning to get to the bus station, since we were not clear about how to get the bus tickets and the departure time of the bus. We walked to the bus station, in the absence of any taxis at 8 a.m., but when we arrived there we were informed that we had to get the tickets at the customs location which was 2kms away! Dilshad, left, pictured inside the grocery store owned by a Chinese Ismaili, right, and a member of her family. Photo: Ali Karim. Copyright. As the bus was not leaving till 11 a.m. we went for breakfast at the Wakhan café with Rehman, walked around the town and then went to meet the Ismaili grocery store owner one more time. She once again treated us to the delicious Yak milk yogurt. We then got a ride to the customs and immigration building. Dilshad, centre, with the Ismaili owner of the grocery store (2nd from left) and her family members. Photo: Ali Karim. Copyright. Dilshad with more Ismailis outside the grocery store. Photo: Ali Karim. Copyright. 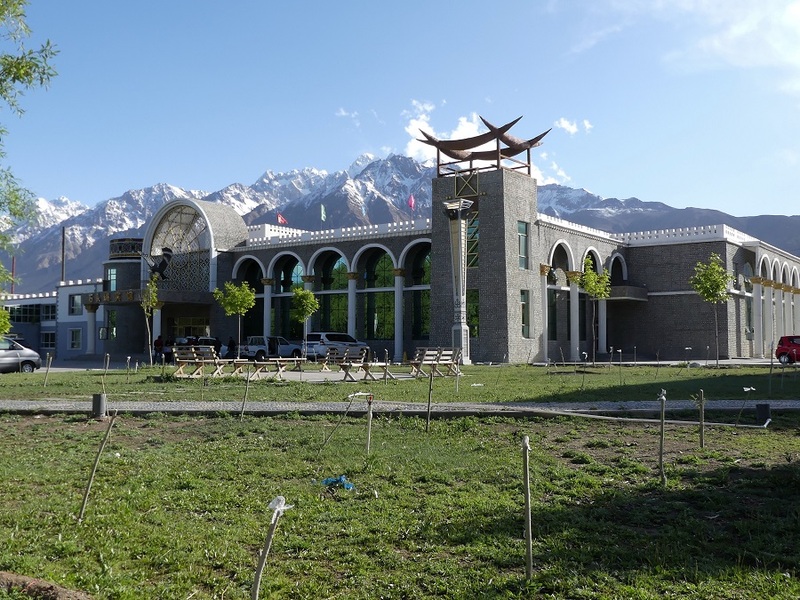 The Ismaili jamatkhana in Tashkurgan against a backdrop of snow-capped mountains. Photo: Ali Karim. Copyright. We arrived at the customs/immigration building at 10:30 a.m., and bought the tickets at 225RMB each at the building’s parking lot entrance. At least we were self-assured we both had seats on the bus, as one could not pre-purchase tickets. One local Chinese immigration official who spoke some English told us that Tibet was even more beautiful than Tashkurgan, and recommended that we should go there by train when we next visited China. We went through the customs/immigration formalities once it opened at 11 a.m. We were 150kms from the China-Pakistan border on the iconic Khunjerab pass, but still in Chinese territory. So to go anywhere outside the building, like making a visit to the bathroom, would required us to be escorted by a police officer. Picture taking was not allowed. Once the bus arrived, we loaded our bags and noted that the bus had different seating than normal; they had 3 rows of “semi sleeper” double bunks. Other than Dilshad and myself and two other passengers — a Chinese and a Korean — all the passengers waiting to board the bus were Pakistani men. Many of them are from Hunza and come to work in Tashkurgan’s handicraft or gem stone stores on Monday, and return to Pakistan on Friday. 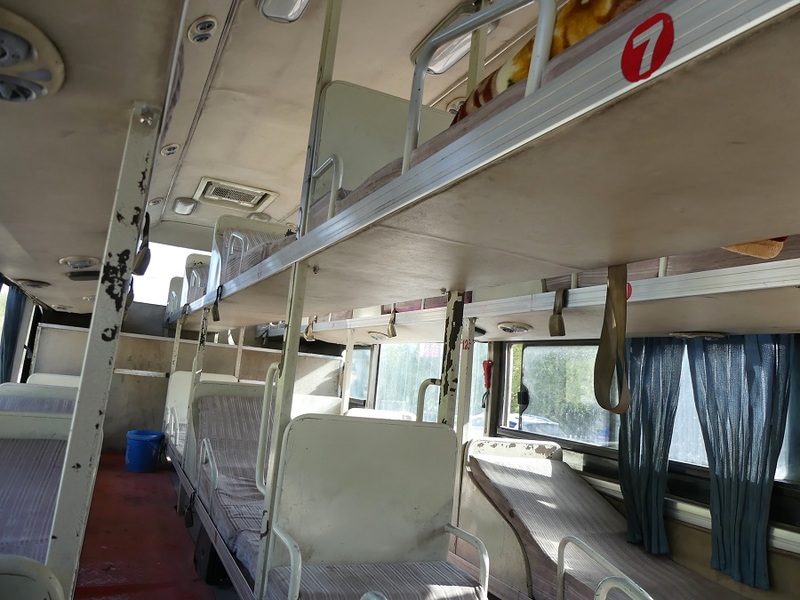 Inside of bus with semi-sleeper bunks. Photo: Ali Karim. Copyright. We were not allowed to board the bus for quite some time, and it was not clear why. After checking our passports again, the officials finally let us board. The bus took off after 1 p.m.
Dilshad was the only woman on the bus, but the passengers were all very nice and made her feel comfortable. The problem on the bus was that many passengers smoked including the drivers. Since we had officially “exited” China through immigration, we were still in China, and were escorted by an armed Chinese soldier, who also smoked! There were several police checkpoints along the way, where our ID’s were checked again and again, intermittently either in the bus or outside the bus. There was no clear protocol. Bathroom breaks were jungle bathroom breaks, and the Chinese posts did not provide any bathroom facilities. The road was sparsely populated, with simple basic homes along the way; mostly yak, goat and sheep rearing, with some crops grown for food where irrigated. We were informed all these areas were populated by Ismailis. There was spectacular scenery along Karakorum Highway on route to Khunjerab Pass. Karakorum Highway snakes past some of the highest mountains on earth. This photo was taken on route to the China-Pakistan border located on the iconic Khunjerab Pass. Photo: Ali Karim. Copyright. The scenic Karakoram Highway was sparsely populated, with simple basic homes along the way; mostly yak, goat and sheep rearing, with some crops grown for food where irrigated. Ali and Dilshad were told that all these areas were populated by Ismailis. Photo: Ali Karim. Copyright. 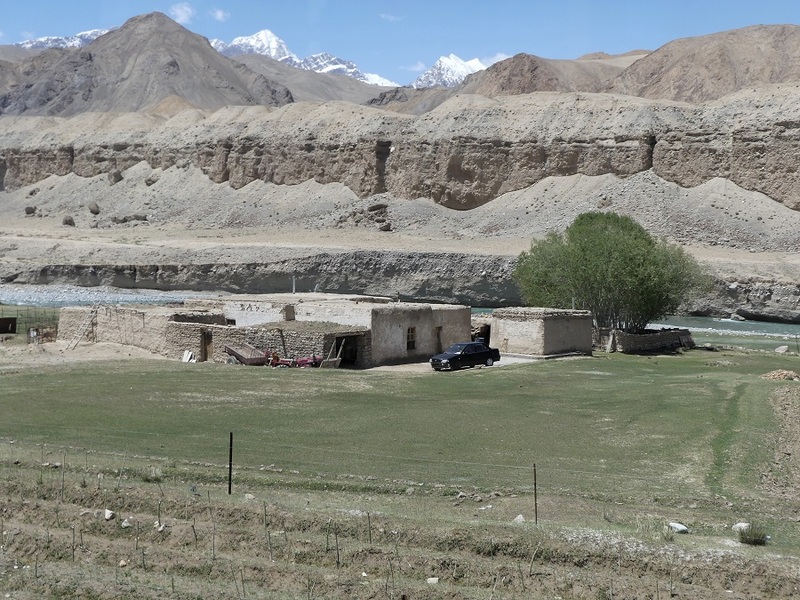 The road was sparsely populated, with simple basic homes along the way; mostly yak, goat and sheep rearing, with some crops grown for food where irrigated. Ali and Dilshad were told that all these areas were populated by Ismailis. Photo: Ali Karim. Copyright. 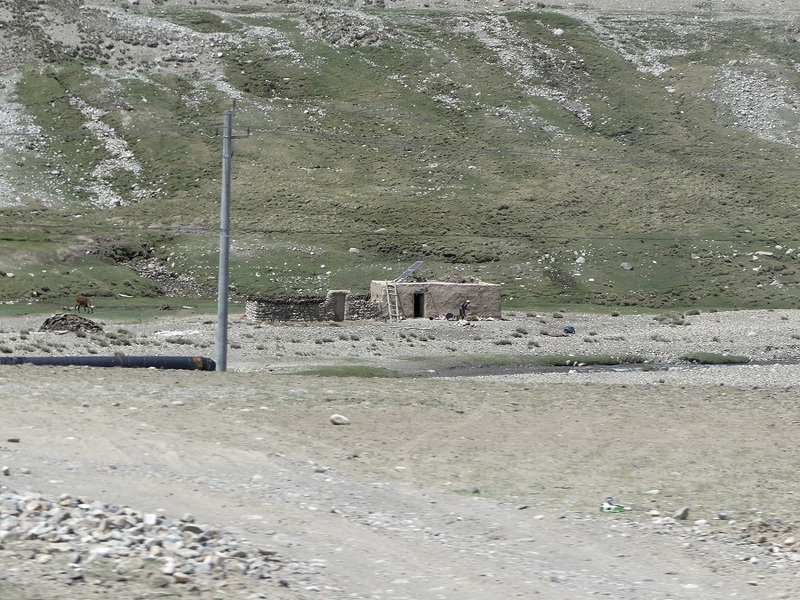 A simple basic home on Karakoram Highway on the way to Khunjerab Pass. Ali and Dilshad were told that all these areas were populated by Ismailis. Photo: Ali Karim. Copyright. Khunjerab Pass is at an altitude of about 4,800m (15,800 ft), and is the highest paved border crossing in the world. 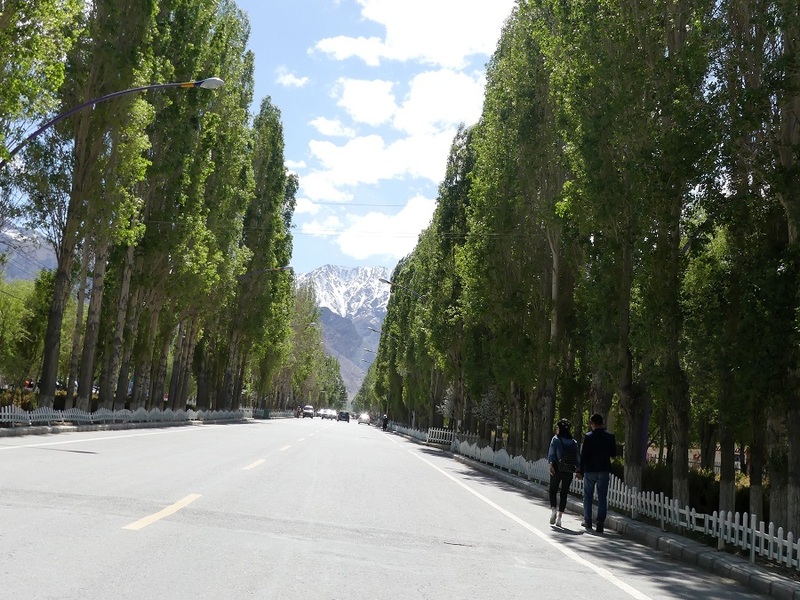 Khunjerab means “Valley of Blood,” which locals attribute to the bandits who once preyed on caravans on what used to be one of the main crossing points on the Silk Road to China from the Indian sub-continent. Buddhism and spices made their way this way. This has to be the highest altitude in the world we have ever been to. At the crossing, the bus simply drove into Pakistan, changed from driving on the right to driving on the left, and stopped on the Pakistani side for a jungle bathroom and photo breaks. There was no stopping for customs/immigration formalities as that was already completed in Tashkurgan, China, which was 150 kms behind us. Sost, Pakistan’s northernmost town, was still 90kms away. 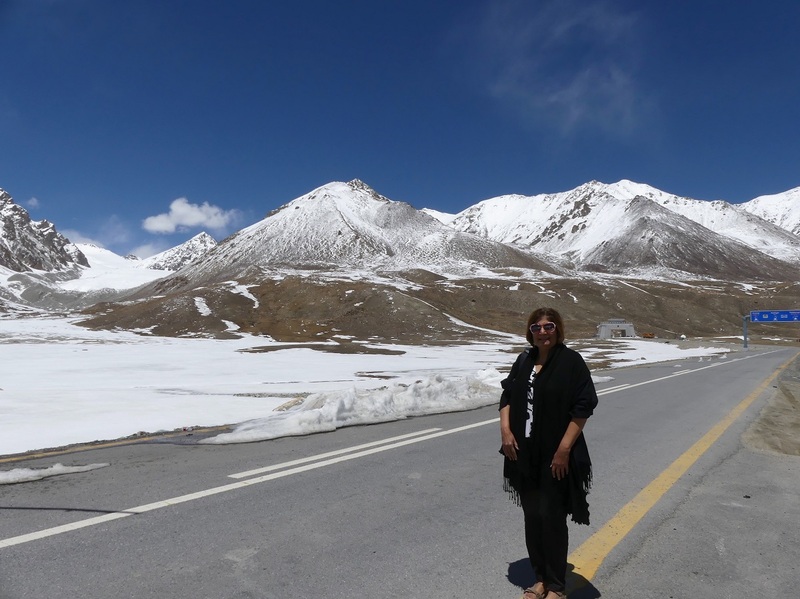 The air at Khunjerab Pass was cool, but not cold. We also did not feel the lack of oxygen, but then we were not exerting ourselves either. There was snow all around and the scenery was beautiful. 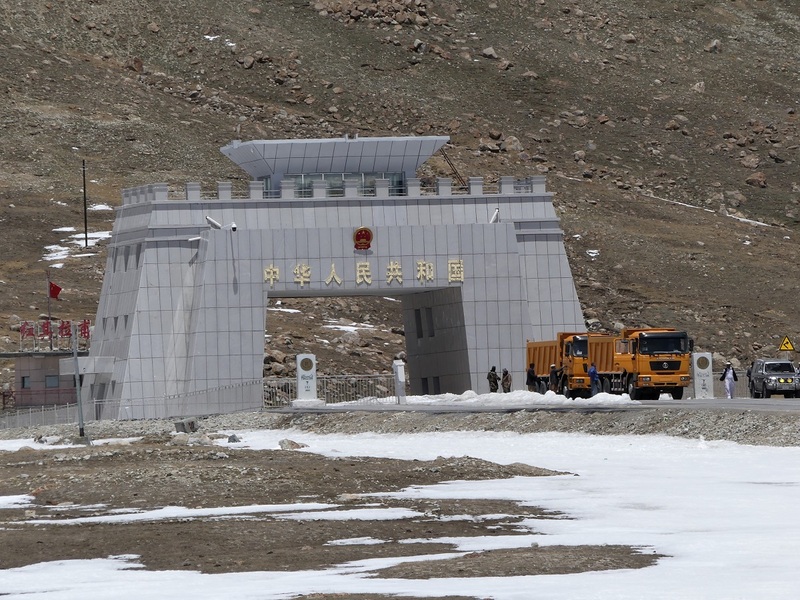 The Pakistan-China border crossing at Khunjerab Pass, as seen from the Pakistan side. The iconic pass on KKH sits at an altitude of about 4,800m (15,800 ft), and is the world’s highest paved border crossing. It is closed for several months during winter because of snow. Photo: Ali Karim. Copyright. Bus passengers take a photo-op upon entering the Pakistani border at Khunjerab Pass along the famed Karakoram Highway. Photo (from video): Ali Karim. Copyright. Dilshad is seen just inside Northern Hunza, Pakistan, with the blue highway sign behind her pointing to Tashkurgan and Kashgar in China. Photo: Ali Karim. Copyright. Now we were officially in Pakistan after having spent many wonderful and unforgettable days in China in Shangai, Urumqi, Turpan, Kashgar and Tashkurgan. We were now ready to commence what would turn out to be the most beautiful part of our Silk Road journey — Hunza! I can assure readers of this blog that they will find our accounts and photographs of this hospitable and magical “kingdom” truly enriching and inspiring. Last updated: November 27, 2016. Forthcoming (Week of November 28, 2016) – Commencement of Ali Karim’s Hunza series. It is indeed wonderful to know there are Ismailis in China. We look forward to our beloved Imam visiting them and one day even see a new jamatkhana built for them. Just like Syria, not many of us knew there were so many murids there too, until after Imam gave them deedar. Thanks for sharing, and I am sure there are Ismailis in many other places around the world about whom we know very little about at the moment! Hi Zinat, Thanks for your comments. You are correct; there are likely many more Aga Khani Ismaili communities we need to discover and learn about like we recently have from Afghanistan, Tajikistan, Syria, etc. I have visited up to Khunjerab Pass but from Hunza side. This travelogue is exquisite with time the two spent in socialising with people living there. One can learn a lot from their travelogue. Thank you editor for publishing Ali Karim’s fine piece. HI Zarbha, thanks for the nice feedback. What DIlshad & I find most rewarding travelling the way we do, is to meet, learn from, and interact with local people. There is so much to learn from people of other cultures, backgrounds etc. Something we have found very refreshing is the lack of materialism in almost all places outside the USA. Quite an extraordinary initiative and awesome travel experience of Southern Silk Route, illustrated with stunning photographs. Connecting with other Ismailies in far flung areas must have been heart-warming. I was always wonderstruck by Marco Polo’s journey of nearly 25,00 miles around 1400. Thanks Hardev. This was indeed the best trip we have ever done; and most rewarding. Like you said, its difficult to imagine how the Silk Road Traders of the old days made this journey with poor paths/roads, very mountainous/rugged terrain, and all the issues like bandits, few hotels around, no places to go and shop for food etc etc. Hats off to them. Once again….beautiful images, beautiful travelogue…I have been following your travel through western China religiously and enjoying every step of your journey. Looking forward to # 5, and more. Thank you so much for sharing such an eventful journey of yours through this picturesque part of our planet! I was very touched by seeing the Ismaili members and the jamatkhana. Your description of the journey made the reader feel that we were present there. Thank you and look forward to see more through your camera lenses. This is Aziz Bhimani, Saira’s dad from Carrollton. I was in Hunza Gilgit for a week just a month ago. I am so glad that you are posting all these details. I took over 300 pics and many videos. I was fortunate to have taken the trip. Keep posting and happy and safe travels. Hi Aziz, Thanks for the words of encouragement. This has truly been one of the most memorable experiences of our lives.